We've seen ways in which quite a few marketers earned their bonus, but the bright lad (or dame) who dreamed this one up deserves a serious promotion. 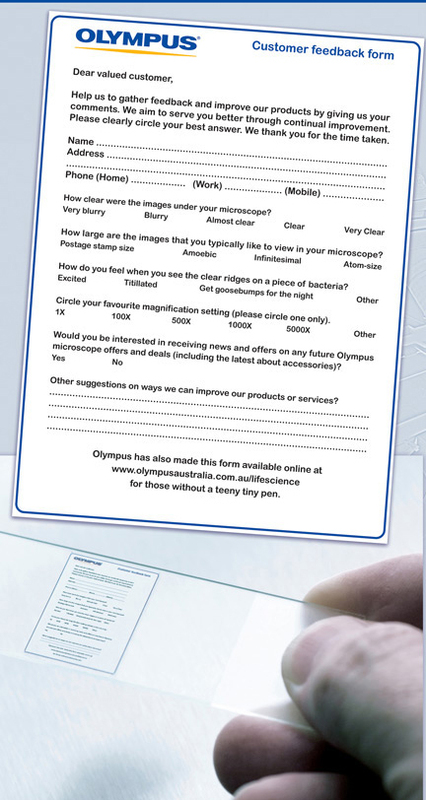 In what's likely to be confirmed as the "world's smallest questionnaire," Olympus sent out slides with questions to valued high-end microscope customers in order to boost awareness and hopefully drum up more business. The survey was shipped just like any other specimen slide, and it reportedly drove up traffic to the firm's website by around 24-percent. Click on for a closeup of the actual questions.